I'm aware that you deliberately decided against using a stereotypical girly color scheme for Pen but as a suggestion wouldn't it be beneficial if her colors had a slight variation compared to Plok's and Wubba's colors in case of their eventual collective appearance in the same panel? Because they all would fit into the same color palette if they all appeared in an old game unless this is intentional. She could always change her colours later if she wants. A pretty clear statement of intent if I've ever seen one. Although at first I thought it might be a dig at the inescapable Bowsette meme. I am intrigued by what's within those dissolute establishments. I love pen! I was so scared that plokette was going to be the new character! Well done! Just noticed that Wubba is bouncing past what I suppose is some ketchup on the sidewalk. Love the new character! Will she be playable in the next Plok game? Or is the next Plok game two players with Pen being the second player? 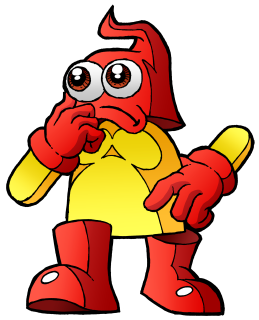 Also, the first time I saw this, I thought Pen could be Plok's girlfriend but saw that she is Plok's cousin. I don't mind this. I wonder what kind of girlfriend Plok will have. It's possible, if it makes sense in the game. Pen is an amazing addition to this universe and she looks great for a... uh, what is the name of Plok‘s species if I may ask?